Study identifies diet supplement which boosts muscle stamina via mitochondria in animal studies. The benefits of exercise are well known, but physical fitness becomes increasingly difficult as people age or develop ailments, creating a downward spiral into poor health. Now, researchers at Duke Medicine report there may be a way to improve exercise tolerance and, by extension, its positive effects. The new study describes a small molecule and its metabolic pathway that work together to optimize energy use in exercising muscles. In mouse studies, animals that received a nutrient supplement that increased activity of this pathway ran longer and farther than those that were not supplemented. The opensource study is published in the journal Cell Metabolism. The current study focused on a metabolic enzyme called carnitine acetyltransferase, or CrAT, which uses the micronutrient carnitine to boost the energy economy within mitochondria, the tiny engines of cells. The team note that CrAT has been known about for many years, however, its role in exercise was unidentified. To investigate this the researchers engineered mice that lack the gene encoding CrAT, specifically in skeletal muscle, and evaluated their ability to perform exercise. The CrAT-deficient mice were compared against a control group of mice that were identical, except they had the CrAT gene. As suspected, the data findings showed mice that lacked the CrAT gene tired earlier during various exercise tests because their muscles had more difficulty meeting the energy demands of the activity. The lab then introduced a carnitine supplement. The results showed that exercise tolerance improved only in animals with normal CrAT activity in muscle. The team state that these results strongly imply that carnitine and the CrAT enzyme work together to optimize muscle energy metabolism during exercise. The researchers note that the findings suggest that CrAT and the metabolite it produces help the mitochondrial engines respond more efficiently when muscles transition from a low to higher work rate, and vice versa. They go on to stress that more research is needed to fully understand how this system improves energy economy during exercise, as well as validate the findings in human studies. The team state that responses to any given exercise regimen or intervention can vary tremendously among individuals, which means that both genetic and environmental factors influence exercise-induced improvements in physical fitness and overall health. Nutrition is one of those factors, and the lab say they are interested in identifying nutritional strategies to augment the positive effects of physical activity. The current study suggests that the CrAT enzyme might be targetable through such strategies. For the future the researchers state that clinical trials and additional animal studies are underway to define the role of CrAT in muscle energy metabolism. The lab go on to add that the short-term goal is to determine whether carnitine supplementation enhances the benefits of exercise training in older individuals at risk of metabolic disease. their long-term plans include efforts to identify other genes and metabolic pathways that influence individual responses to exercise intervention, with the goal of developing personalized programs to optimize the health benefits gained by physical activity. The team conclude that this work is not meant to imply that everyone should be taking carnitine supplements as human trials have not been completed and futures studies need to consider underlying genetics, lifestyle factors and acquired conditions. 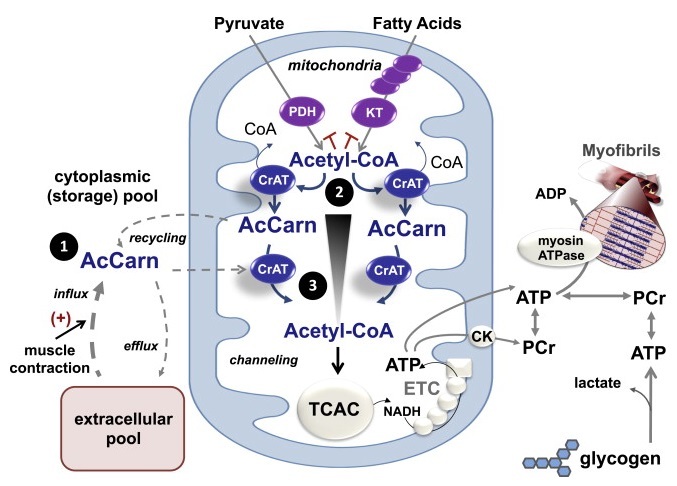 Acetyl-CoA is the universal catabolic intermediate that fuels the TCAC, which in turn serves as the main source of reducing equivalents (NADH) that support oxidative regeneration of ATP and PCr by the ETC and mitochondrial CK. During transitions from low to high exercise workloads, TCAC flux must increase to keep pace with the high ATP demands of muscle contraction. A shortfall in acetyl-CoA provision will force heavy reliance on substrate-level phosphorylation, resulting in depletion of PCr and muscle glycogen reserves, along with production of lactic acid and other deleterious metabolic byproducts. CrAT functions to sustain high rates of oxidative ATP regeneration via three proposed mechanisms. First, contraction-induced recycling and/or import of acetylcarnitine (AcCarn) supplies a readily available source of acetyl group donors to buffer transient deficits in glucose, amino acid, and fatty acid catabolism. Second, by residing in close proximity to the various enzymatic sources of acetyl-CoA (e.g., PDH and ketothiolase [KT]), CrAT alleviates product inhibition of metabolic enzymes while also regenerating essential cofactor (CoA) necessary for continued catabolic flux. Third, CrAT permits rapid and efficient delivery of acetyl groups from their site of production to the TCAC (blue arrows). Thus, by acting as a conduit for acetyl group transfer, CrAT overcomes the thermodynamic inefficiency of diffusional flux, which requires an energetically unfavorable gradient profile (black triangle). Carnitine Acetyltransferase Mitigates Metabolic Inertia and Muscle Fatigue during Exercise. Muoio et al 2015.